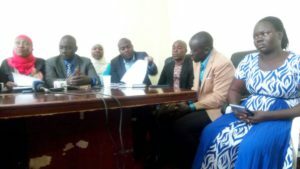 Oposition KCCA councillors launch Togibukula campaign against age limit removal. Photo by Raymond Mayanja. 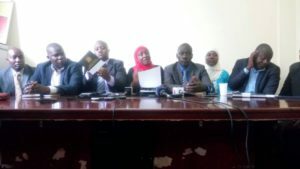 NRM legislators this afternoon are meeting at Parliament to discuss how they will present the private bill, advocating for lifting the Presidential limit. But by press time, the oppostion parties are in the office of the Leader of the Opposition at Parliament, also on the same matter. Asuman Basalirwa, the president of Justice Forum, told PML Daily this afternoon that some individuals have been fighting the lifting of the age limit but now they want to fight it as a group. ” We are moving from individual fight to group struggle. We are working with those who think, it is an evil to amend the Constitution, to allow one man’s rule,” Basalirwa argued. Currently, amending Article 102(b) of the Constitution has become a contentious issue, with religious leaders calling for referendum. Once its blocked legally Museveni will not eligible to contest for the Presidency in 2021. And his recent interview with NTV, Museveni told teh world that one those who have clocked 75 years and above is not fit to be a leader. Dr. Sam Lyomoki, workers MP backed Museveni also arguing that medically that person cannot memorialize things well and his weak. Opposition KCCA councillors this afternoon have launched campaign named ToGIBIKULA, literally meaning don’t temper to open the Constitution. The political leadership, while launching the campaign at City Hall, a function presided over by the deputy Lord Mayor Sarah Kanyike said tomorrow they are marching to the Constitutional Square. The procession will done as an expression to President Yoweri Museveni and NRM legislators not to amend Article 102(b) of the Constitution, to allow those who have clocked 75 years and above to contest for the Presidency. Opposition KCCA councillors launch anti-age limit removal campaign. Erias Lukwago, it was revealed during the press conference that he will lead the procession to Constitutional City. Currently, the military Police is manning the venue, blocking the anti-age limit to occupy it, fearing to give room to protestors, to conduct a revolution similar to that of the Arab spring revolution. The city councillors condemned NRM legislators for allowing to be used to amend the Constitution. Parliament, to allow Mr. Museveni become a life President,”Kanyike argued. They added that the movers and pushers of this motion are being so self-centered, adding that Uganda’s history has been characterized by constitutional instabilities that have left the country torn into pieces.